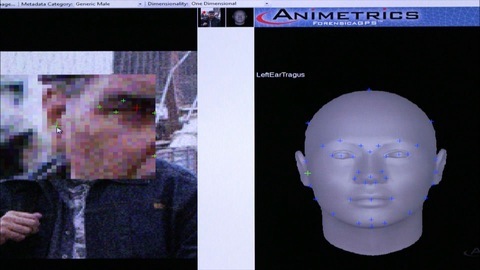 Facial recognition software like this could one day be used on video collected at public events. Fan cameras at local sporting events may one day be scanning the crowd for more than just a great reaction. On Saturday, Pacific Northwest Nation Laboratory, in collaboration with the Department of Homeland Security, collected video at a minor league hockey game in Washington state for the first public test of a new facial recognition program. Prior to the game, twenty volunteers submitted their likeness to a database. A lab specializing in facial recognition will use these images and video from the game to test whether its technology can successfully pick out and recognize the volunteers from the crowd. Hockey fans were told about the test before the game and given the option to not be filmed. Department of Homeland Security spokesman John Verrico says the footage will only be used to identify the faces of the 20 volunteers who were scattered among the crowd. But hockey fans on Saturday may not have noticed any new high-powered cameras or suspicious machines scanning crowds. That’s because DHS used off-the-shelf cameras to record video. “The whole purpose of what we’re doing now is to check the state of the science, using standard video cameras to tell us whether or not we can use facial recognition to find Waldo,” Verrico says. Developing recognition technology that can use video captured by regular cameras will allow DHS to tap into a much wider network of existing surveillance cameras, than if the technology required video from specially designed cameras. This could potentially help identify suspects in cases like the attack on the Boston Marathon. Verrico says this is the first test of this nature, but believes there will be more tests to collect video in different conditions.